You’ve learnt how to start sailing, now find out how to stop, by using the lying to technique! If you've read the other articles on this site, you've learnt how to start, and how to sail, but you've not yet read about how to stop! Sailing is a bit like driving a car, the tiller is the steering wheel, and the sheets are the accelerator, but there the similarity ends - there are no brakes! To stop a dinghy, you have to use the wind, just like when you're moving. Lying to is a way of stopping a dinghy, for a short period of time, perhaps for swapping over crew and helm, or for untangling ropes, or making quick repairs. On a close reach (i.e. 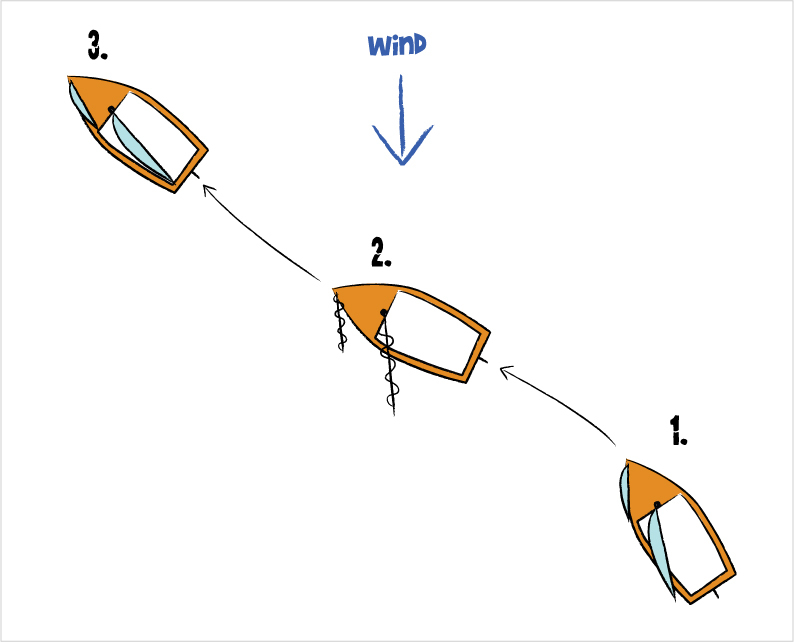 between a beam reach and close hauled, see Stage 1 of the diagram above) let out main and jib sheets completely (or just main in a single hander) so the sails are flapping over the leeward side of the boat. This cannot be done on anything other than a close reach, as the sails cannot be let out far enough to stop momentum (see Stage 2 of the diagram). To go from lying to back to sailing, simply sheet in the sails, and sail away (Stage 3 of the diagram). Lying to is preferred to going head to wind, because when head to wind, the flapping of the sails will push the boat backwards, and once against the rudder, the boat will turn into the wind and power will come back into the sails.